Stockholm, Sweden on March 28, 2000. 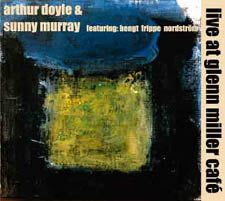 It was planned to bring Arthur Doyle alone to Sweden but he came with Sunny Murray and the two gave three remarkable concerts and one is this from Glenn Miller Café in Stockholm. Very few were prepared to the sound heard from Arthur Doyle and very few had heard any of his records. Some remembered his presents in “The Black Ark” with Noah Howard but the sound was a shock. Sunny Murray's hard, free percussion was a counterweight to Arthur's playing and their performances were fascinating. Bengt “Frippe” Nordström had been a free jazz cult person since the 60's in Stockholm and these 12 minutes turned out to be his last performance. He was ill and passed away a few months later.